Hotel Sapphire brought you a special promotion for banking employees to enjoy 15% off from Monday to Thursday 5.00 Pm to 7.00 Pm. 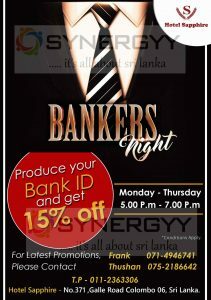 The promotion will valid only for bankers and the Bankers needs to submit your Bank ID to obtain this special discount. 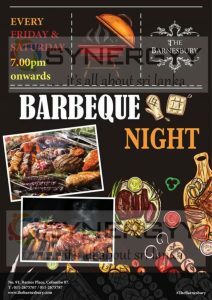 Enjoy your special Barbeque night on every Friday and Saturday at The Barnesbury from 7.00 Pm upwards. This special promo will valid only for short period. 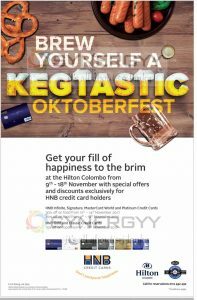 For more details about the latest promotions contact to The Barnesbury at No. 91, Barnes Place, Colombo 07. Café Beverly of Welikada brought you a special promotion of 20% off on your Bill for this mother’s day. 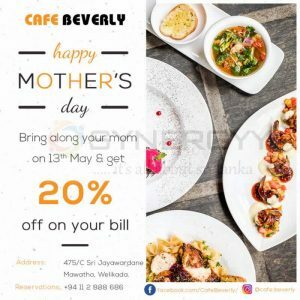 Being along your mom to Café Beverly on 13th May 2018 and get 20% off on your bill. Café Beverly Address: 475/C Sri Jayawardane Mawatha, Welikada. Gardenia Coffee Shop at Ramada Hotel brought you a special promotion to fire up and create your own mongolian stir fry. Choose between a mouth watering selection of seafood and meat items prepared live at cafe. 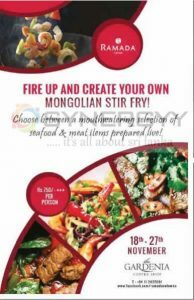 Visit Gardenia Coffee Shop at Ramada Hotel on 18 th to 27 th November 2017 and experience the Mongolian Stir fry. 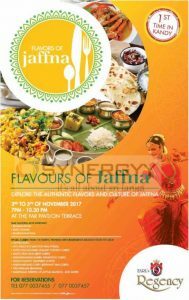 For the first time in Kandy Hotel Earl’s Regency organise an Jaffna Food festive from 3rd to 5th November 2017 at the Fair Pavilion Terrace. Korean Ginseng is one of the most widely used and acclaimed herbs in the world. 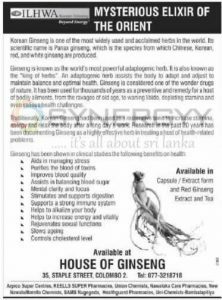 Its scientific name is Panax ginseng, which is the species from which Chinese, Korean red and white Ginseng are produced. Traditionally, Korean Ginseng had been used as a restorative tonic to increase stamina energy and relax the body after a long day’s work. Research in the past 20 years has been documenting Ginseng as a highly effective herb in treating a host of health-related problems. 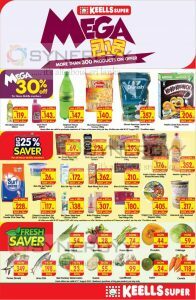 Keells Super brought you a Big Sale for the August under Keells Super Mega Vasi, the promotions are valid for more than 300 Products till 15th August 2017. Off the Hook announces a special Sri Lankan Night food festive. Enjoy range of Sri Lanka foods such as Egg Hoppers, Plain Hopper, Pittu, String Hoppers, Pol Roti, Kottu, Pol Sambol, Katta Sambol, Seeni Sambol and Kiri Hodi with a wide range of Sri Lankan Curries to choose from. The newest addition to the city’s dining scene, Movenpick Hotel Colombo’s Japanese restaurant is now open! Conquer the gastronomic nirvana of Japan with the Robata Grill and Lounge. Take the glass elevator to the seccmd floor and allow time to drink in the surroundings. Watch the chefs on the open charcoal grill in the evenings, a concept derived from the Japanese Izakaya. Chef Nobu brings in his expertise with carefully crafted sushi and a wide selection of bento lunch boxes for your tasting pleasure. 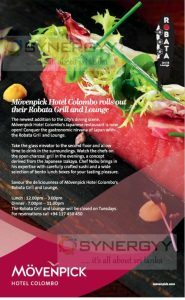 Savour the deliciousness of Movenpick Hotel Colombo’s Robata Grill and Lounge. To enjoy a plethora of cuisines at the longest and most delicious Brunch buffet in town, we suggest you really skip breakfast. After all its The Kingsbury Brunch. From 11.30am to 3.00pm on every Sunday. Complimentary bottle of bubbly for a group of 4 persons. Extended selection of Japanese delicacies. 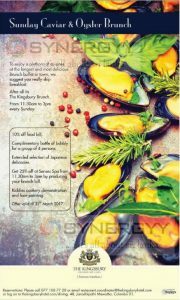 Get 25% off at Senses Spa from 11.30am to 3.00pm by producing your brunch bill. Kiddies cookery demonstration and face painting. 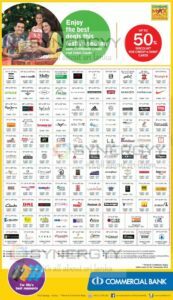 All the above offer valid till 31st March 2017. 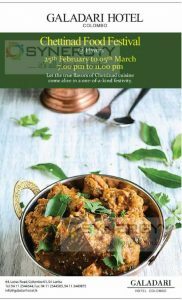 Flavors Resturant at Galardari Hotel Colombo organise a Chettinad Food Festival from 25th February to 5th March 2017 from 7.00 pm to 11.00 pm. 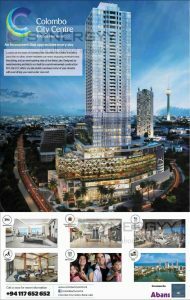 Located at the heart of Colombo, the Colombo City Centre Is truely a place like no other, where residents can enjoy shopping, entertainment fine dining, and an awe-inspiring view of the Beira Lake. Designed by award-winning architects and built by a world-renowned construction firm, the CCC offers you the stylish, luxurious home of your dreams with everything you need under one roof. Griffiths shared his ideas and experiences gathered working extensively in Asia as an Executive Principal for Aedas; a global architectural and design firm considered to be among the top 10 in the world. Aedas along with their Sri Lankan counterpart KWA Architects are the designers for Colombo City Centre, one of the largest mixed developments under construction in Colombo with over a million square feet of space spread over 48 stories including luxury apartments, city hotel & a multilevel retail mall. “As new trade corridors expand such as the focus by China on the 21st century Silk Road which is to connect Asia with Europe, the role of cities as catalysts for trade between Asia and the rest of the world needs to respond and adapt” Griffiths elaborated while also highlighting the issues with current trends of urbanisation seen in Asia. “The problem with many of the cities that we have witnessed throughout Asia, is that as the cities expand ever outwards to accommodate the increased growth. The infrastructure, schooling, transport and communication with the additional demand, becomes more stretched, and the essence of what a city is, starts to break down”. “Densification of existing cities with mega structures or high density building! with integrated transport hubs, parks, work, rest and play lifestyles may become the model that all future cities need to move to” Architect Simon Griffiths further elaborated concluding the session. Aedas operates from 14 offices from Hong Kong to Los Angeles. With their extensive presence in China and South East Asia, they are at the cutting edge of the rapid development and growth of emerging markets, and use this experience and understanding, to provide design solutions that will meet the demands of the Asia of the future. it is an essential to meet up your business client in best location, this current business world meeting location itself considered as success of the business. Grand Oriental Hotel always suitable for a best meet up locations for the lunch time or dinner time meeting. one of the best solution is; its located heart of Colombo Fort area and over viewing to harbour. Grand Oriental Hotel offer Executive Lunch Buffet at a best price in the market as Rs. 1,680/- nett per person with range of options. Naniyori a Japanese Restaurant located in Sri Lanka brought you range of Japanese foods and snacks. 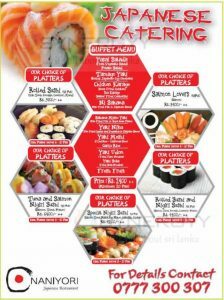 See below details for the Naniyori Japanese Restaurant menu and other details. Grand Oriental Hotel brings very much affordable family dinner buffet at a special price of Rs. 1,800/- per person. I could bet you this buffet would be the one of the lowest price dinner buffet available in city. If you going with your friends, family or your loving person; this would be an ultimate dinner buffet available in city for low price with live music. Don’t wait to experience the tasty family dinner buffet on every Sunday 7.30pm onwards at The Harbour Room. Just for Rs. 1800/- Nett. Per person. 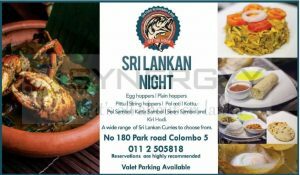 Enjoy Sri Lankan Restaurant Lunch Buffet at a special price of Rs. 800/- from Grand Oriental Hotel. Grand Oriental Hotel brings you an exciting new Sri Lankan menu to tantalize your taste buds!! Commercial Bank announces a special promotion for the Commercial Bank Credit and Debit Cards for this Festive season of Christmas. Enjoy Discounts upto 50% on this festive season along with easy payment scheme. PST (Park Street Trattoria) a traditional Italian trattoria, specializing in authentic artisanal cinnamon-fired oven pizzas. We pride ourselves of using fresh locally sourced ingredients that compliments our Italian imported products. 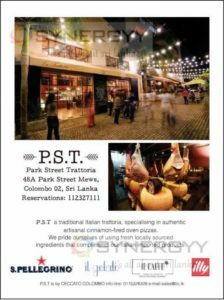 Park Street Trattoria located at 48A Park Street Mews, Colombo 02, Sri Lanka. for more details and Reservations contact PST (Park Street Trattoria) on 0112327111. Flavors restaurant of Galadari Hotel offers Indian style thali menu for you to taste the difference.Escape into a relaxing office lunch break served Indian Thali’ style at Flvours from 12 noon to 3.00 pm daily. Ramada Colombo a 4 star hotel located near galle face green offers Indian Thali Meal menu daily from 12 Noon to 2,45 Pm. 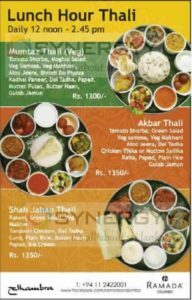 Tomato Shorba, Moghul Salad, Veg Samosa, Veg Makhani, Aloo Jeera, Bhindi Do Plyaza, Kadhal Paneer, Dal Tadka, Papad, Mutter Pulao, Butter Naan, Gulab Jamun. Cinnamon Lakeside Colombo declare Thai Food Festival from 20th to 29th October 2016 from 7.00 Pm to 11.00 Pm at Royal Thai and Terrace. Enjoy the exotic flavours of Thailand at an all-you can-eat buffet Over 50 dishes to savour just for Rs. 2,500/- Nett.